This property offers protection and “reinforcement value” for the existing Splits nature reserve measuring 17 acres. It secures the land rights to the north bluff edge, preventing any house lots there. A small strip of land at the base of the bluff comes with it, providing cover for birds and small creatures. On top, the tree and plant life is quite diverse and includes Pilostes globosa (on Bull Hoof). There is a lot of Jacquinia proctorii including one of the tallest specimens, about 25 feet, and this land would secure the historic trail, once used by duck hunters. The family wants to divest itself soon. 3 or 4 points, about 8 acres. 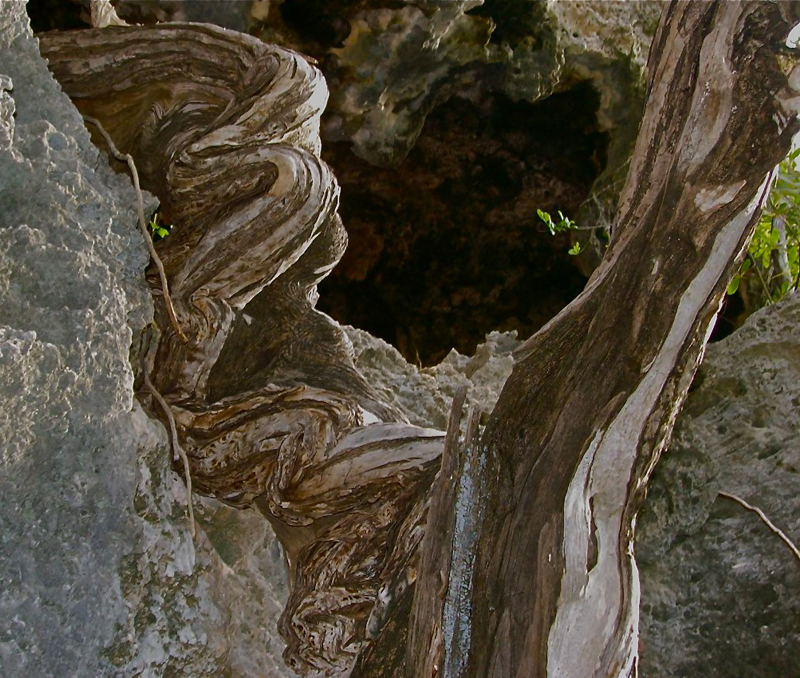 Soon after the formation of the National Trust Mr. Billy Bodden led Brac members to this historic site and natural phenomenon, using the south approach. The rough trail is still flagged and passable today. A water site in the middle of the high bluff plateau is rare, and this one was once used for cattle. Eutrophication is a gradual process and in the midst of the giant ferns (acrostichum aurea) a young fig tree is now growing quite tall. The “pond” (no open water is visible) is oval and both the inlet and outlet cuts are narrow gorges, suggestive of a sinkhole origin for the pond but allowing for another explanation – a collapsed underground river. 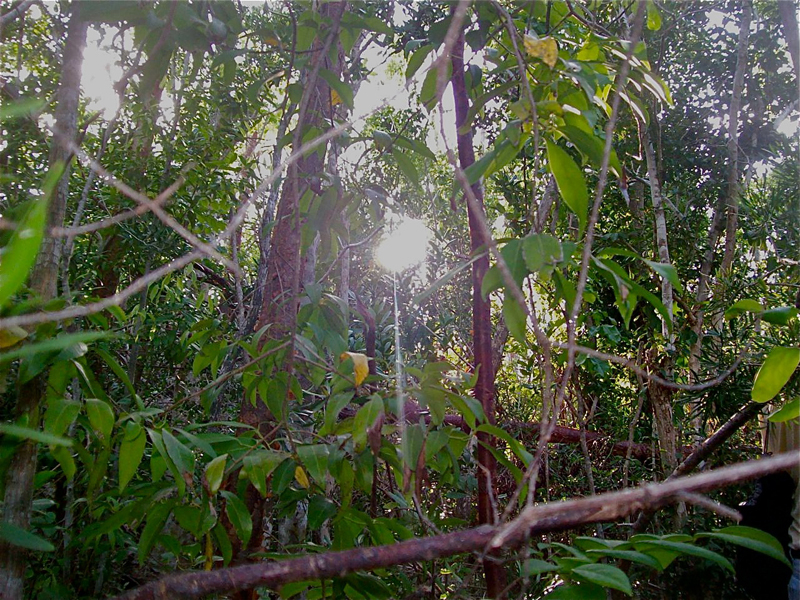 This property was valued at US$50,000 at the height of the market, and it has wonderful associated lands for future link-ups: to the west are Public Beach, The Marshes, and the Red Shrimp Hole; on top of the bluff Consolea millspaughii and the traditional path called Sheldon’s Way; and to the east there are Bat Cave, a pond for seasonal bird-watching, and “Bussy’s Beach”. Both iguanas and Brown Boobies are associated with this area. Block 99A … 4 points … About 6 acres. 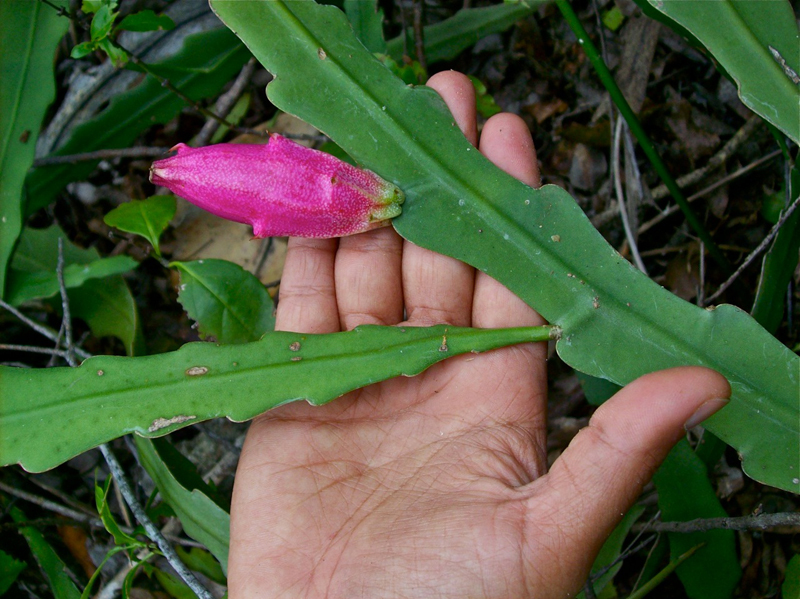 Epiphyllum phyllanthus is rarely seen in the wild anywhere in the world, and this sub-species (plattsii) is exclusive to Cayman Brac. It is classed as Critically Endangered. 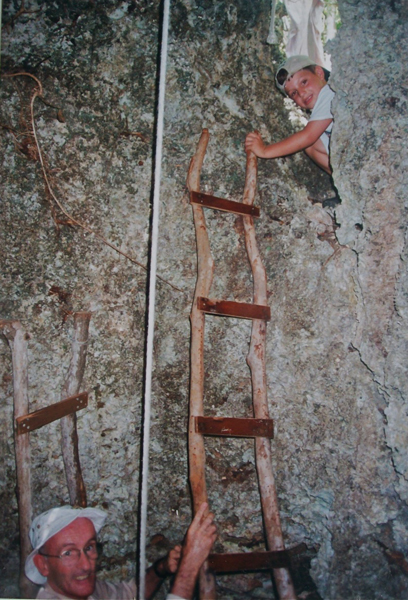 There are two known sites quite close together, one studied by Dr. Proctor in the 1990s, the other discovered by accident in 2009. Due to being cut by a road (the plant occurs on both sides) the blufftop land is all too accessible and very much in demand for housing, especially since Hurricane Paloma. One or two houses are being built there currently. 96D parcel 10 REM 1 … 6 Points (including consolea millspaughii) … One acre would provide at least minimal and urgent protection. 52 acres would include Consolea, the historic trail and “The Mountain”, a mysterious mound. This half-acre of prime Stake Bay Bluff Forest extends from the south rim road to the edge of the cliff, where Brown boobies look for safe nesting sites. 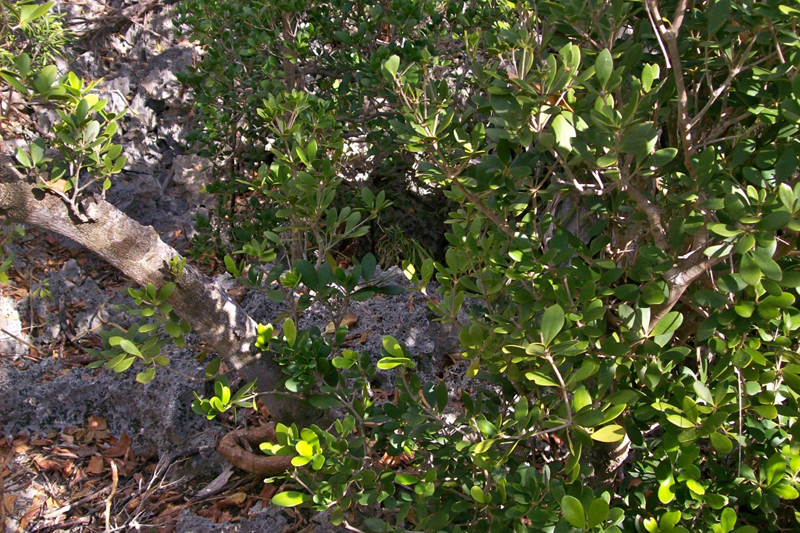 Iguanas live both to the immediate west and east of the property, so it belongs to them as well. The double sinkhole is 25 feet deep and the long axis of its oval shape measures about the same. This property gets a very high score, combining geology, primary forest, bluff edge, boobies and rock iguanas. Block 102A. 5 Points, about 1 acre.